Sardinia, Italy’s second largest island is well known for its summer jet-set tourism along its spectacular coast, especially along the Costa Smeralda in the north-east. 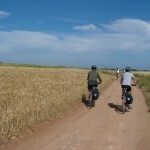 It is, however, an ideal spot as well for active vacations throughout the year, and not in the least for cycling holidays. 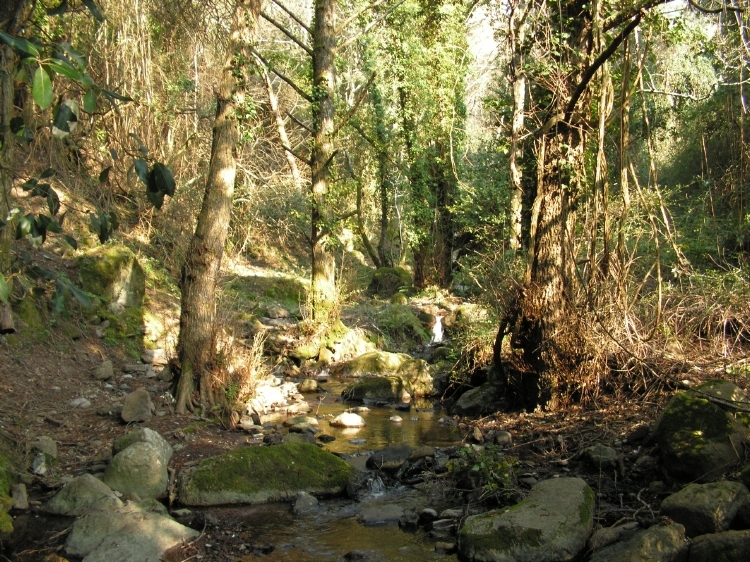 The island is a region of staggering natural beauty and many cultural treasures. Best known for its wild spectacular coastline where towering cliffs are interrupted only by small bays dotted with beautiful sandy beaches lapped at by the crystalline Mediterranean, it is also home to several hidden natural, cultural and culinary marvels. Its ancient nuraghic culture and the remains of several Phoenician and Roman towns, as well as charming medieval towns and villages are only a small distance away from the busy coastal touristic centres, waiting to be explored by the aware traveller. 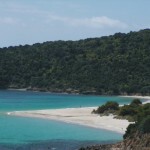 Some of littlest known, but equally beautiful coastal scenery is on the western side of the island, the so-called Costa Corralina and Costa Verde. 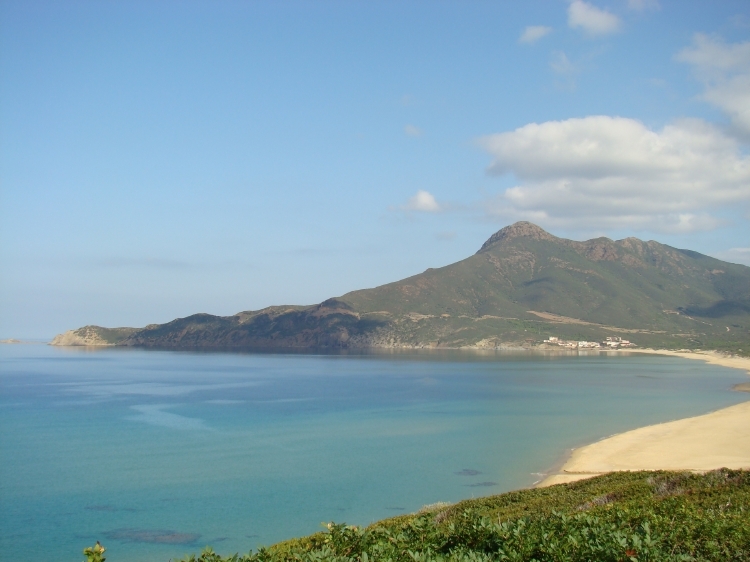 This tour gives you the opportunity to discover both the more touristic and the quiet hidden, but no less spectacular, side of the West Coast of Sardinia. You will start from the charming Aragonese town of Alghero, proudly showing off its Spanish heritage in both architecture and local traditions, and cycle all the way south to magical Pula near Cagliari, well known for the Phoenician remains of the ancient town of Nora. Along your way you will follow some of the most spectacular coastal roads of Sardinia, as well as heading inland to discover the real original Sardinia, untouched by modern mass tourism. 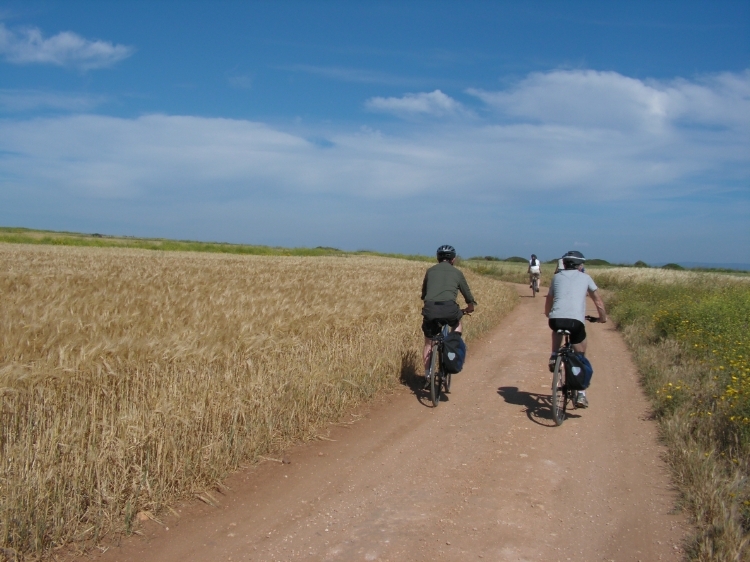 You will cycle through medieval Bosa, through the plains and rolling hills of the Medio Campidano province, along the ancient ruins of Tharros and past the high sand dunes of Piscinas. 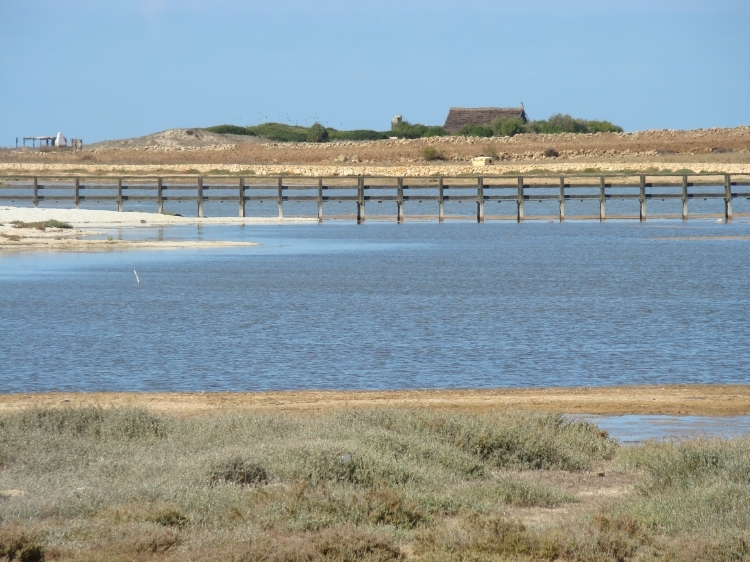 You will see flocks of flamingo’s roaming the wetlands of the Sinis peninsula, explore the old lead and silver mines of Nebida and enjoy the peace and quiet of the island of Sant’Antioco. During your trip you will stay in very nice hotels, located in some of Sardinia’s most suggestive little towns and villages. After your day’s cycling along the amazingly scenic coastal roads or on the quiet inland lanes you will be able to relax with an ‘aperitivo’ and restore yourselves with tasty dinners based on local specialities, knowingly prepared by local cooks that are handing down century-old culinary traditions. 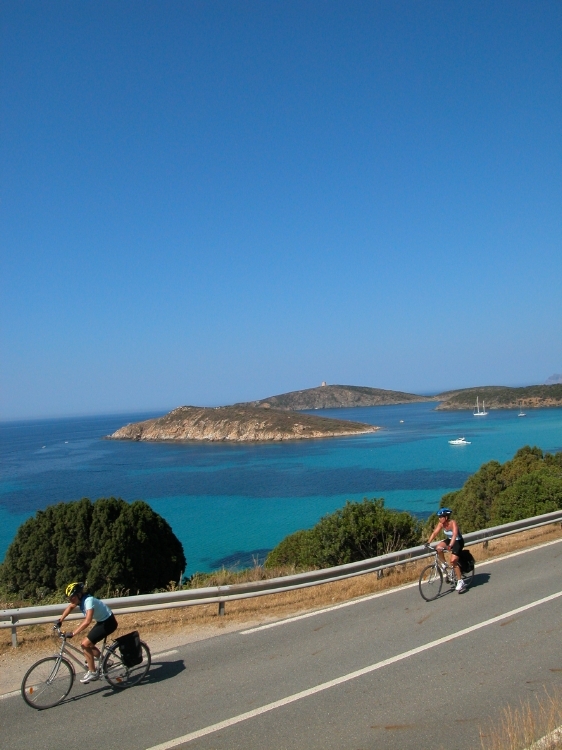 On this amazing cycling adventure you will discover several hidden aspects of the island of Sardinia and see with your own eyes why it has become one of southern Europe’s last ‘secret’ cycling paradises. It will become clear that it takes only a little effort to get ‘off the beaten track’, finding yourselves surrounded by overwhelming nature far away from the crowds. In short, you’ll explore this delightful island in a totally different way. Arrival in Alghero in case you arrive a day earlier. Alghero has an international airport. 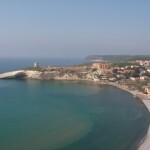 From Milan and Rome Alghero can easily be reached by air. From the airport frequent bus shuttles reach the centre of the town. 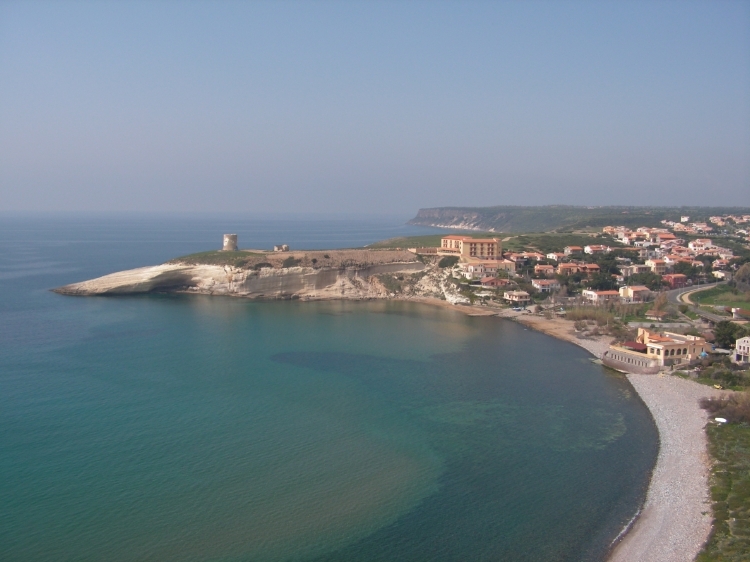 Several hotels can be booked in Alghero, according to your wish. If you arrive one day earlier you have the possibility to explore the old city centre of the charming town of Alghero, with its clear Spanish influences. 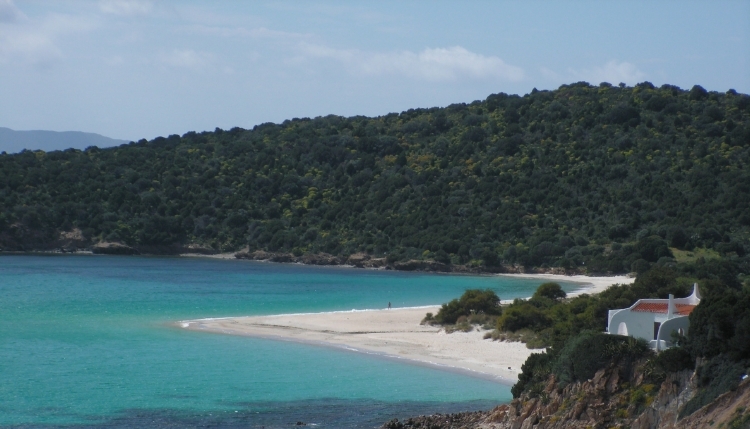 Alternatively you could make a trip to one of the many splendid beaches near the city and enjoy the crystal clear water Sardinia is rightly famous for. After arriving in Alghero (a private transfer from the airport can be arranged on request), you get settled in at the hotel where you will meet with one of our staff for a short briefing of your tour and a bike fitting session. In the evening you are then free to go out and find a nice place to eat dinner. In case you arrive early you may want to take a stroll through the nicely preserved centre of the little town or walk down to the beach for a swim. 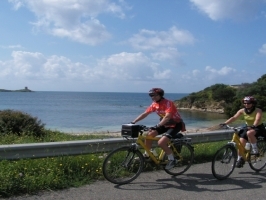 On the first day of your trip you will cycle through the charming little streets of Alghero, the splendid Aragonese (Spanish) city on the Coral Riviera along the west coast of Sardinia. 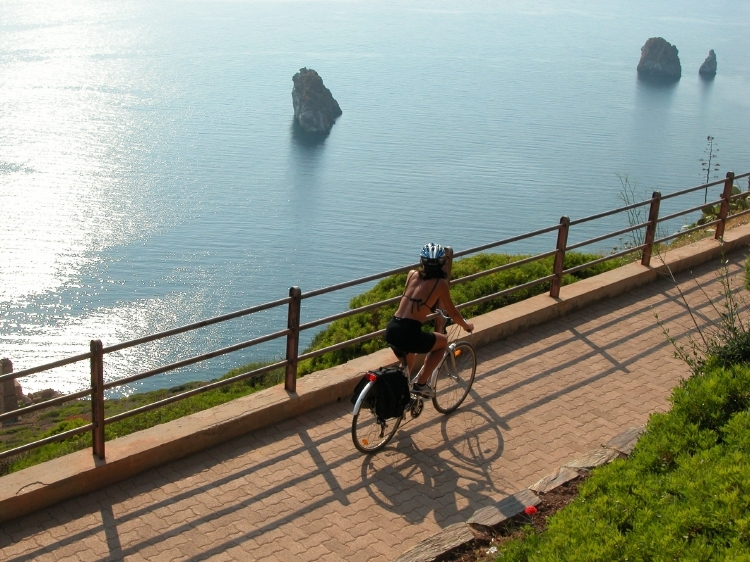 From Alghero you then cycle to the splendid Capo Caccia with its high limestone cliffs and many sea grottos. Here you have the opportunity to explore the Nettuno caves. In the afternoon you then head back to Alghero where after settling in at your hotel, you may go out and enjoy the relaxed atmosphere of the town during ‘aperitivo’. 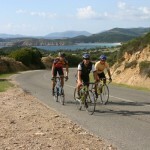 On the second day of the trip you will start out from Alghero and head south along the Coral Riviera. You follow a beautiful and utterly scenic winding coastal road, offering beautiful views on the Gulf of Alghero and Capo Caccia. 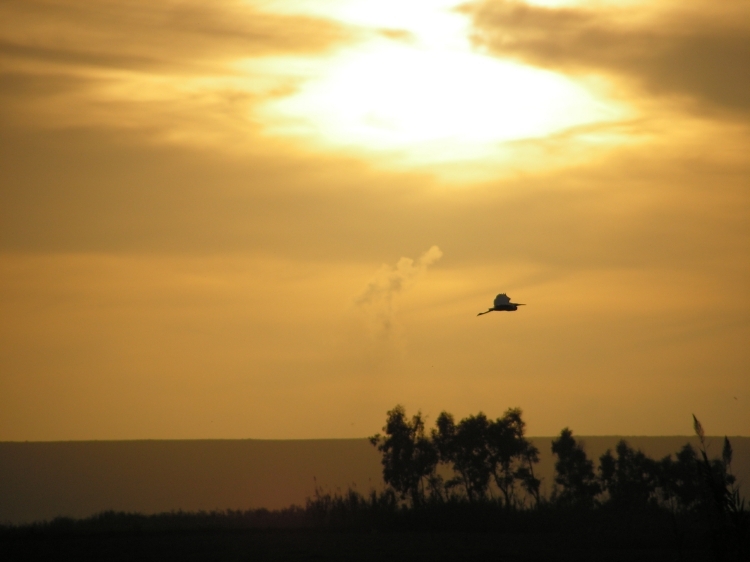 During your day’s trip you will pass by the pink, red and grey cliffs of Cape Marargiu, one of the last places in Europe where griffin vultures still roam. In the afternoon you then arrive at Bosa, a medieval town famous for its fine embroidery and gold filigree works. In the morning you can enjoy strolling through Bosa or go down to the beach for some swimming and sun bathing, before moving inland and travelling through the typical villages of Flussio and Tinnura where the women still weave their wicker baskets. A scenic road takes you to the village of Sagama and then to the refreshing spring of San Leonardo, a perfect place to restore your forces. 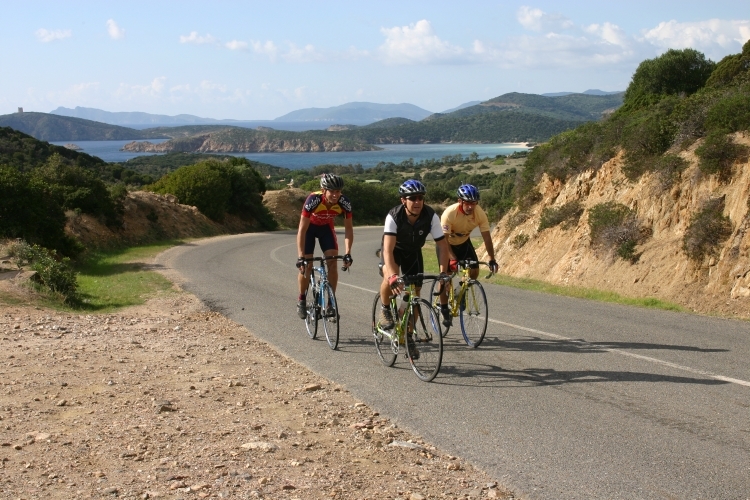 You will end your day’s trip cycling over a quiet picturesque country lane leading to the village of Santulussurgiu, famous for its artisans producing the best horse saddles in Sardinia. After settling in at the hotel you can relax and enjoy a hearty meal in some nice little restaurant in town. 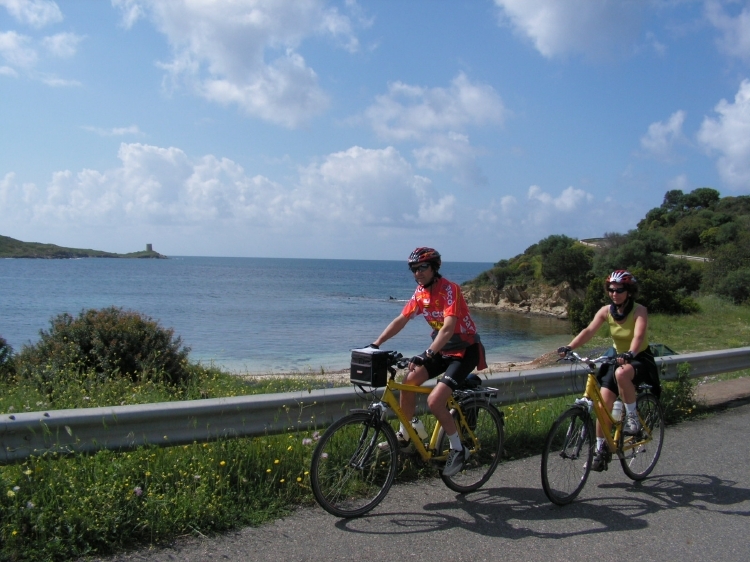 Today the route takes you back to the sea with a panoramic descent towards the flat coastal plains of the Sinis wetlands. 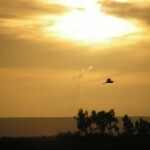 Here you will be able to admire large colonies of pink flamingos. Shortly further down the road we reach one of Sardinia’s marvels, and undoubtedly one of the most beautiful spots to be seen, the white quartz beach of Is Arutas. 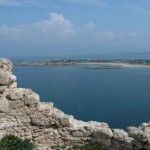 Your trip may then take you to the Phoenician ruins of Tharros, well worth a visit, and on to your hotel. After settling in at the hotel you can freshen up and go out for ‘aperitivo’ and dinner. Today you have the opportunity to visit several interesting spots around San Salvatore Sinis, or you can just lie on the beach and work on your sun tan. Possibly you cycle down the peninsula for a bit to San Giovanni Sinis, where you may see locals fishing for mullet or brass from traditional grass fassone boats. In case you did not go there yesterday, you may visit the fascinating Phoenician ruins of Tharros with a history of inhabitation stretching back over 2,500 years. You may also go see the early Christian church of San Giovanni. In the evening don’t forget to sample a glass of vernaccia, the local dry white wine. In the morning you will be transferred to Arborea after which you start cycling to reach some of the best known – but also some very much unknown – beauty spots of the Costa Verde. 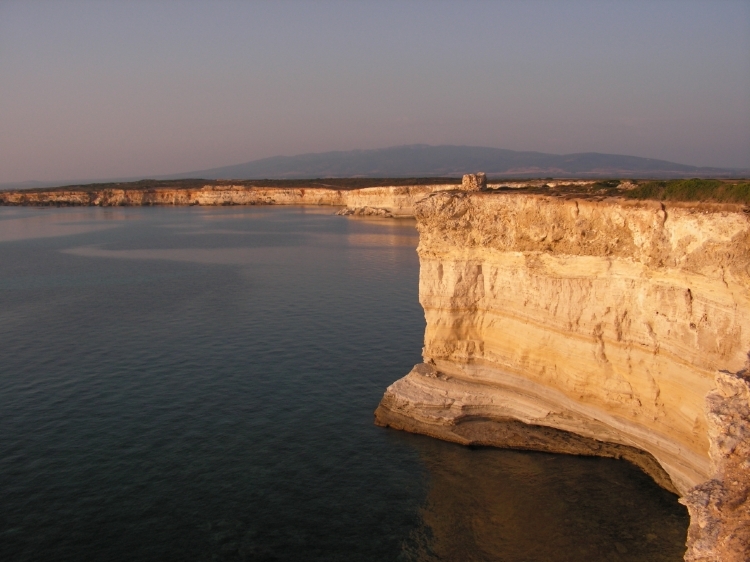 Here we admire some of the most savage natural scenery of the island. We also visit the famous Piscinas beach with its blindingly white high sand dunes that can reach 50 meters or more! A short stretch then takes us to the little town of Arbus in the Medio Campedano province, where we settle in at our hotel. During today’s stage you will explore Sardinia’s ancient mining history, which has its origins in long gone Phoenician and Roman times. You will cycle past the fascinating abandoned mines of Ingurtosu and Masua, now abandoned but once flourishing industrial towns housing up to 5000 inhabitants. Until the 1960’s these mines produced a large part of Sardinia’s lead, zinc and silver ore. They are now included in a UNESCO Geo Park. After visiting the mines you pass by the charming bay of Cala Domestica and the looming mass of the Pan di Zucchero cliff, on your way to the old ore washery at Nebida. The now abandoned industrial complex is located in an extremely panoramic spot, nestling halfway the rocky cliffs and the sea, and can only be reached by climbing down 540 steps! In the afternoon you then check in at your hotel in Nebida itself in time for a stroll through the village and a well-deserved dinner. 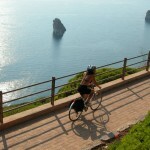 From Nebida you first enjoy a beautiful descent to Fontanamare, after which you then reach Portoscuso. Here you board a ferry to Carloforte, where locals still fish the red tuna. Indeed, this little village is known for its pasta ‘alla carlofortina’, that is with pesto-and-tuna sauce! Maybe you can halt here for lunch and sample this local delicacy. 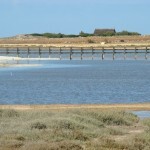 From Carloforte you then continue to the island of Sant’Antioco, connected to the mainland by a large artificial dike. 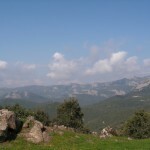 The island is really beautiful with its meadows, sprinkling green in spring and golden yellow during summer and early autumn. Your day then ends in Calasetta. In the morning you could well visit the Pisan sanctuary at Tratalias, one of the most important monuments of the Sardinia Romanesque period, dating from the 13th century. On our way to our next hotel in S. Anna Arresi we then cycle along the lake Monte Pranu, an artificial lake that was created for irrigation purposes and now hides the remains of several nuraghi under water! 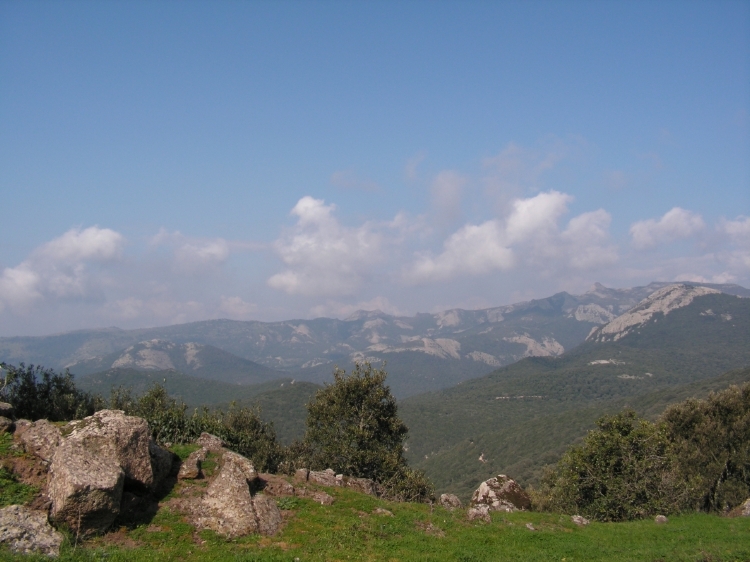 On your way to S. Anna Arresi you then savour the quiet peace of the rolling plains of the Sulcis. The final stage of our trip takes us along the beautiful and panoramic south coast with its gleaming white beaches, unspoilt landscapes and high vertical cliffs. 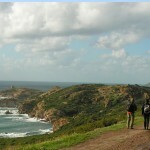 We first halt to admire Cape Malfatano dominated by its well preserved 16th century tower. 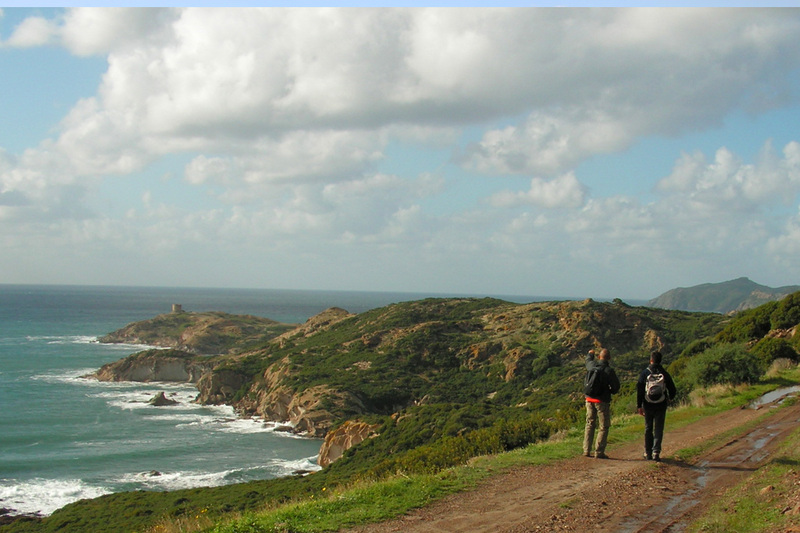 At Capo Spartivento, the most southern point of Sardinia, we enjoy the wonderful views of the coast from the light house on top of the high cliffs. Finally we arrive at the major Phoenician site of the island, Nora, where we visit the extensive archaeological remains before heading to our hotel in Pula. The tour ends in Pula after breakfast today. 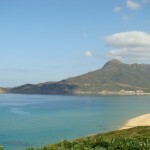 A local bus or private transfer can take you to Cagliari. A taxi transfer to other destinations can be arranged on request. All nights are spent in beautiful, characteristic 3-star hotels (only the hotel at Nebida is a 2-star) or equivalent agriturismo’s. All rooms have en-suite facilities. Neither dinners nor picnic lunches are included in the tour price. 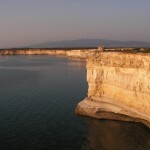 Nights 1&2: The first two nights are spent in a beautifully located hotel at Alghero. 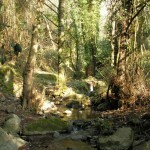 The hotel is within walking distance of the city centre. Night 3: Tonight you stay in the medieval town of Bosa. All important monuments of the city are within easy reach of the hotel’s premises. Night 4: The third night you stay in a nice hotel located in Santulussurgiu. Night 5 & 6: Your next two nights are spent in a cosy hotel in the village of San Salvatore Sinis. Night 7: This night you stay in yet another nice hotel at Arbus. Night 8: Tonight you will stay in a 2-star hotel in the little village of Nebida. Night 9: Your next night is spent in a cosy hotel in the village of Calasetta. Night 10: This night you stay in yet another nice hotel at S. Anna Arresi. Night 11: The last night is spent in a 3-star hotel near Pula, on the south coast of Sardinia. Easy to Moderate (2-3): Mostly moderate rides but with some longer climbs. All roads are well paved and mostly quiet with limited traffic except for some periods during summer and holidays. Extensions are possible on some days. Fitness: Some experience with bicycle touring and a good general physical condition will certainly make your travel experience more enjoyable. You should be able to cycle for several hours a day also in hot dry weather conditions. 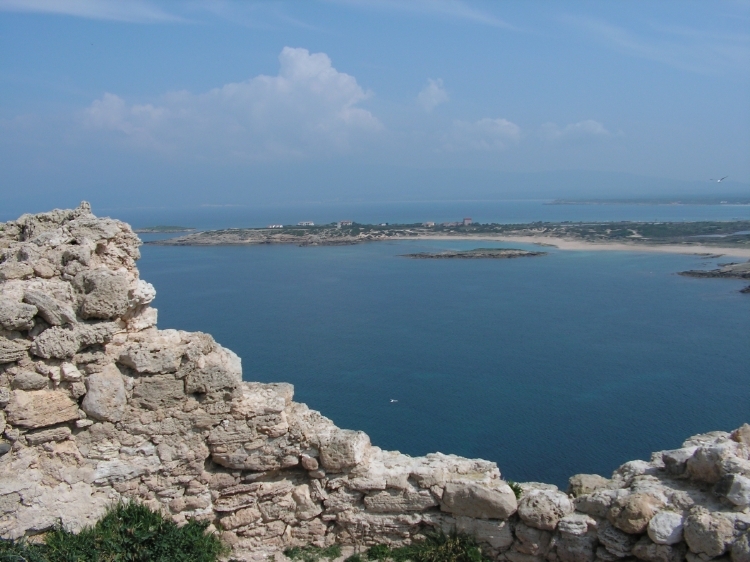 Arrival: The tour starts in ALGHERO which can easily be reached by bus from the Alghero International Airport. Departure: The tour ends after breakfast on day 12 in PULA. From Pula Cagliari can easily be reached by public bus. An optional private transfer can be arranged. Please note that departures are planned every Saturday. For departures on other days a supplement is requested. 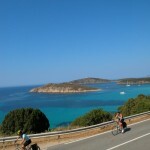 It is possible to extend your tour with a few days at Cagliari or in any other town or resort in Sardinia. Details and prices on request.